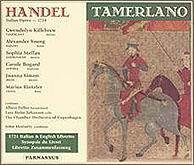 The first recording ever made of Handel’s opera Tamerlano, a nearly-complete version highly acclaimed by critics, is now reissued on the Parnassus label. In 1970, Bernard Jacobson described it as “the best Handel opera recording I have ever heard.” The three-disc set, running nearly four hours in length, is being offered with complete libretto for the price of two discs. The 1970 recording, newly remastered with advanced digital techniques, features mezzo-soprano Gwendolyn Killebrew as Tamerlano, soprano Carole Bogard as Asteria, mezzo Sophia Steffan as Andronicus, mezzo Joanna Simon as Irene, tenor Alexander Young as Bajazet, and bass Marius Rintzler as Leone. John Moriarty conducts the Chamber Orchestra of Copenhagen with continuo supplied by cellist Lars Holm Johansen and harpsichordist Albert Fuller. The use of female singers as an alternative to castrati was Handel’s own preference and was honored in this performance. The 92 page booket includes complete libretto in Italian and English, along with extensive program notes and detailed synopses in English, French, and German.